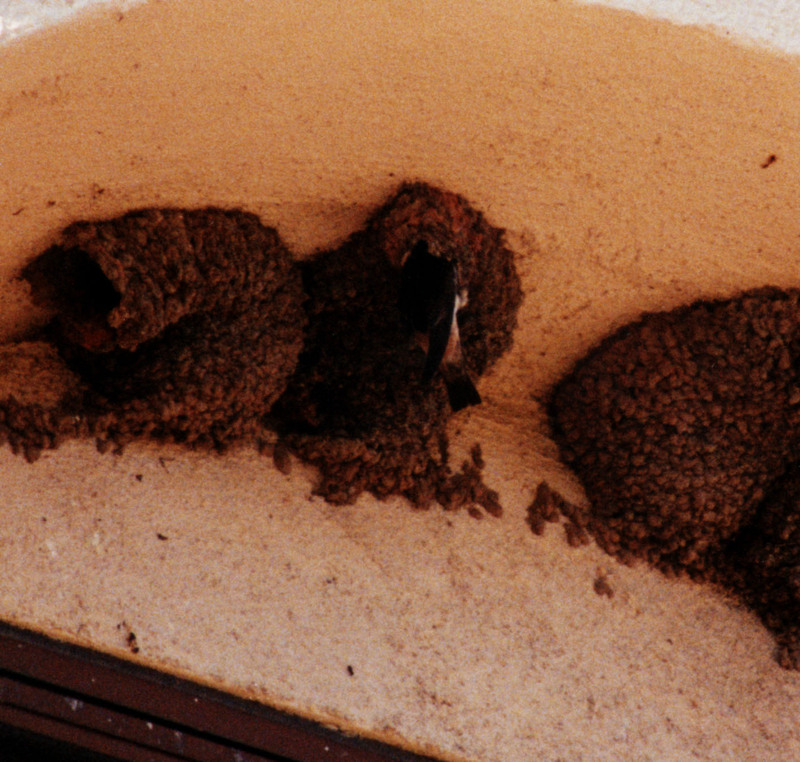 Cliff Swallows flying about their mud nests. Photo by Jay Fahlen, 6/12/05. 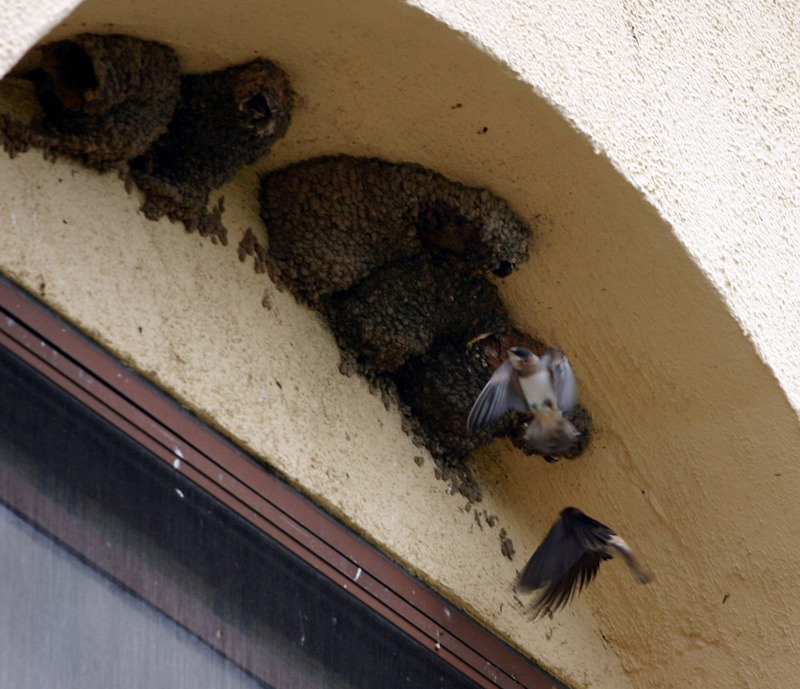 They frequently swooped up and into their nests, to feed the babies inside. 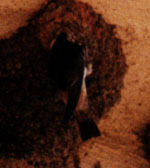 In this picture, you can see a baby Cliff Swallow poking its head out of the nest! Photo by Jay Fahlen, 6/12/05. 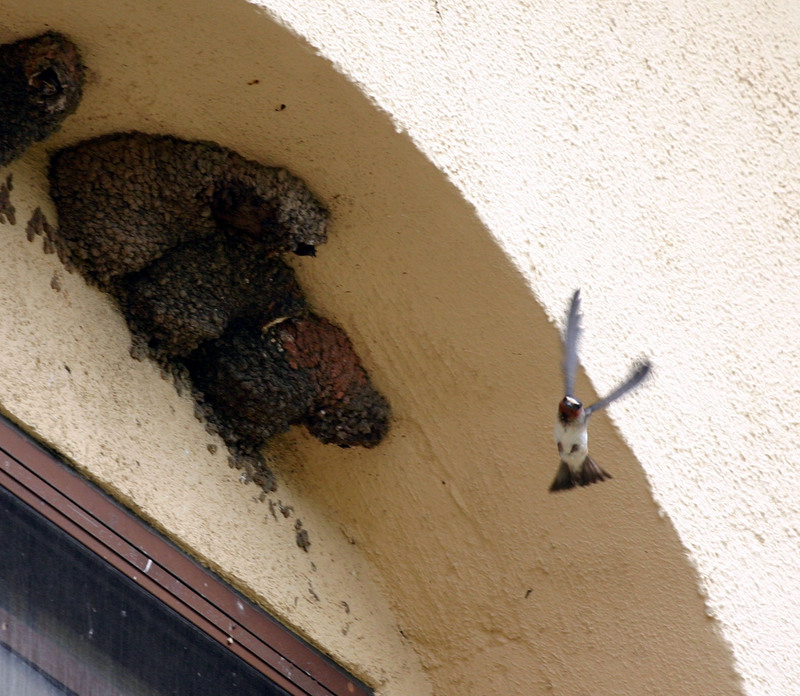 Nothing but action shots of these Cliff Swallows. Here you can see the brownish-orange throat and bit of white on the forehead. Photo by Jay Fahlen, 6/12/05. 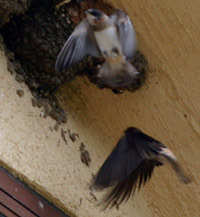 Here's a parent Cliff Swallow poking its head into the nest to feed a baby! Photo by Jason Finley, 6/8/05. 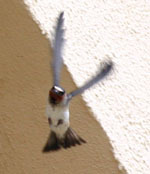 This is how you're most likely to see a Cliff Swallow: flying swiftly overhead. Photo by Jay Fahlen, 6/12/05. 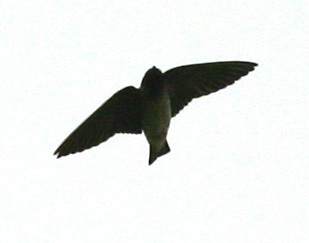 Another one flying overhead. You can make out the colors a little better here. Photo by Jay Fahlen, 6/12/05. 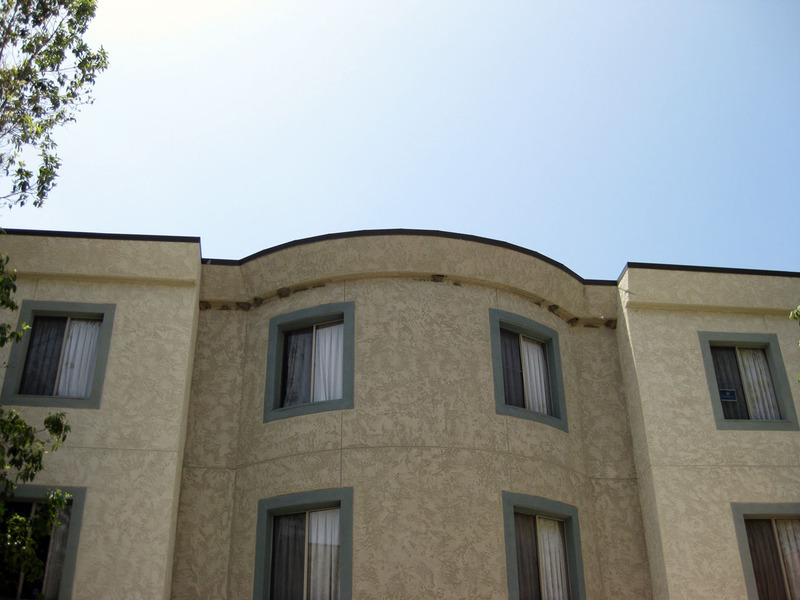 Canyon Point Residential Suites, recently expanded to accommodate new residents: a bunch of awesome cliff swallows! Photo by Jason Finley, 5/11/09. Marvel at the skill of these guys as they swoop in and out of their designer mud nests. Photo by Jason Finley, 5/11/09. 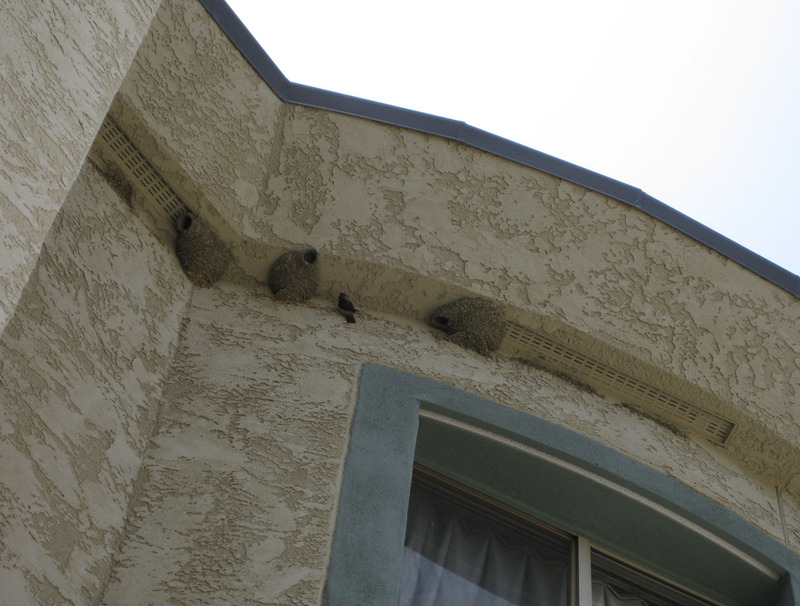 These nests are on the east side of Canyon Point. Photo by Jason Finley, 5/11/09. 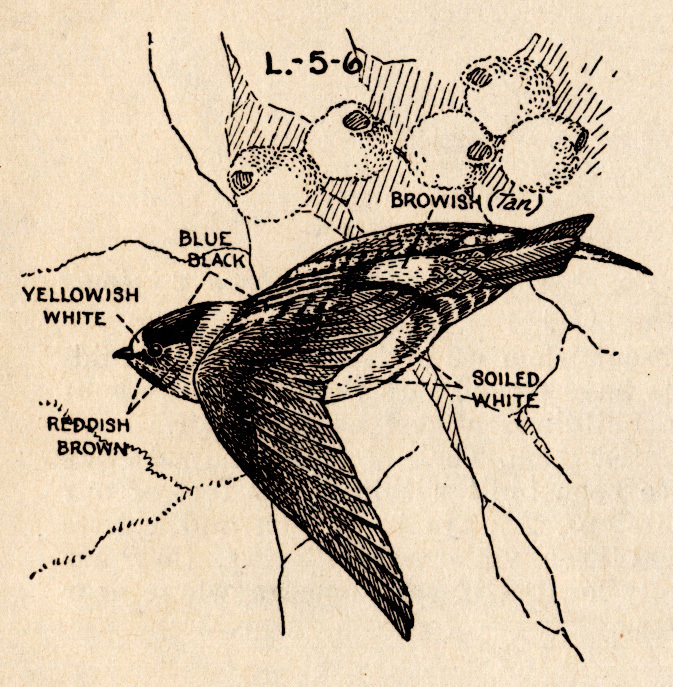 -Illustration by Robert C. Stebbins from "Birds of the Campus" (1947) by Dr. Loye Miller. Description: Small. 5" in length (beak to tail), about the same size as a sparrow. Dark, squarish tail, brownish-orange rump. 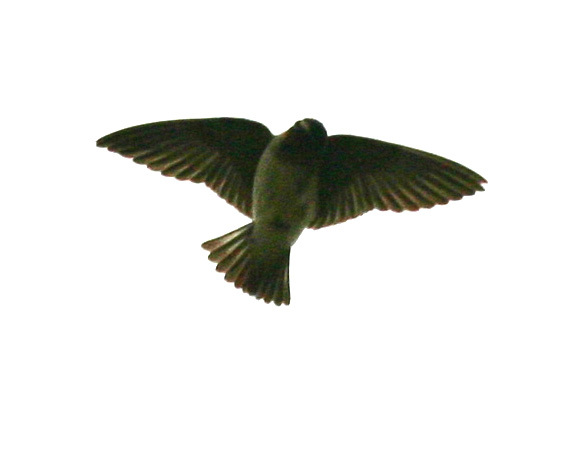 Light (white-ish) undersides, except for warm brownish throat. Small beaks. Dark blue-back on upperparts, except for white patch on forehead. Long wings for their size. Sound: They make squeaking, chittering sounds that can almost sound dolphin-like. Listen to a Cliff Swallow calling! 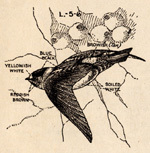 Link is to the sound page for this bird from the Cornell Lab of Ornithology's All About Birds. Notes: You're most likely to see these birds flying around in circles overhead. You'll almost never see them just sitting somewhere. Your best bet is to go where their nests are (e.g., Building 209 at the VA Center, or Canyon Point Residential Suites, or the Ashe Center) early in the morning, soon after sunrise. 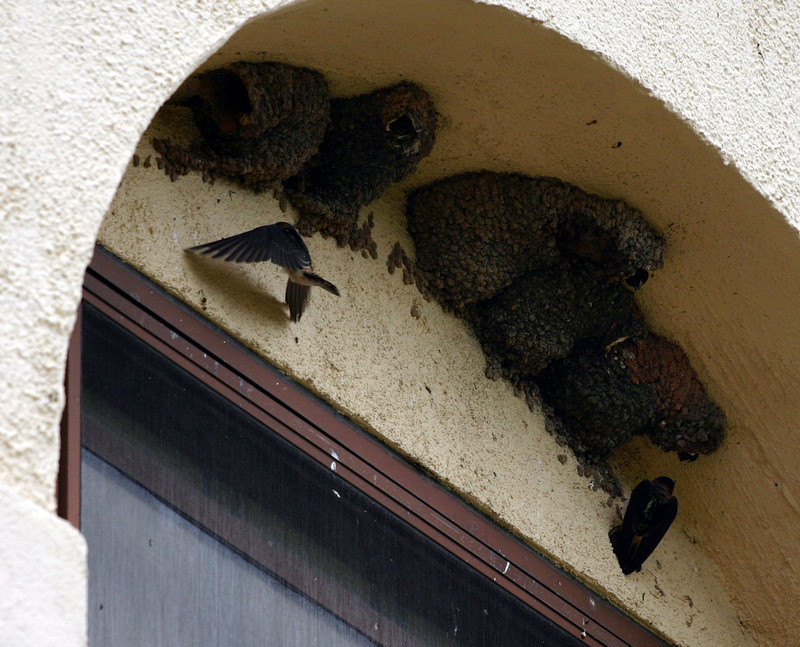 You'll see a great many of them, flying and tittering, and swooping into their nests to feed their babies. Some birds arrive in late March, and there seems to be a second incursion in early May. 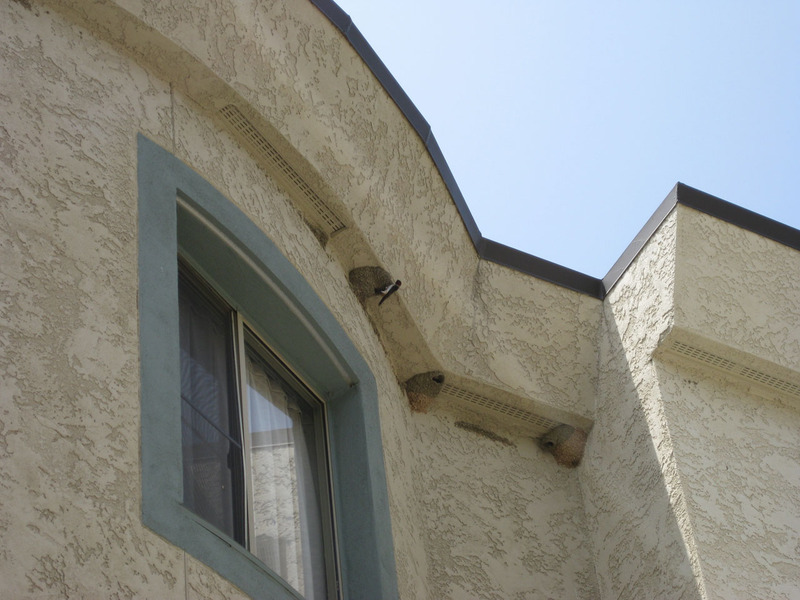 There are nesting colonies in the general vicinity, but their flask-shaped "adobe" nests (mud and straw) have not yet appeared on our buildings. -Miller, Loye. "Birds of the Campus, University of California, Los Angeles," from University of California Syllabus Series, No. 300. Text by Loye Miller, illustrations by Robert C. Stebbins. Los Angeles: University of California Press, 1947.